Hiroko Yoshimoto was born and raised in Japan and moved to Los Angeles when she was a teenager. She received her undergraduate and Masters Degree from UCLA, graduating with the highest honors. Her work has been exhibited all over the world including the Tokyo Metropolitan Art Space, Osaka Contemporary Art Center, Los Angeles County Museum of Art, Ventura County Museum of History and Art and numerous art galleries. 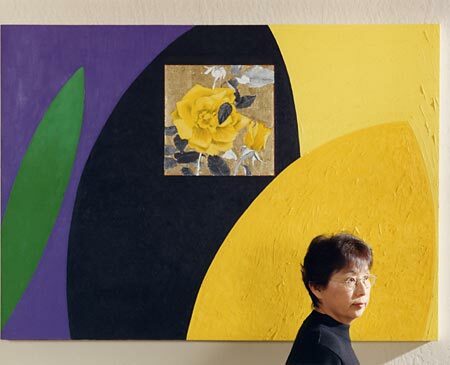 Named a “Living Treasure of Ventura,” Yoshimoto often incorporates in her work themes from her native Japan. Working in a variety of media, she is often conceptual in her paintings, evoking philosophical observations that are stimulating, peaceful and uniquely personal. In “Yellow Rose for Teiko II”, part of her “Offering Series,” a yellow rose is representative of the artist’s late mother and symbolizes “farewell.” Gold-leaf drawings permeate the “Offering Series,” with their flat shapes referencing medieval altars for prayer offerings. Yoshimoto is a distinguished member of the art department faculty at Ventura College. Hiroko Yoshimoto’s documentation took place in 1999. The FOTM Archive contains extensive information about this artist.